Bomb Lobber with better stats, whose effect you can control. This is a good inclusion in control decks. This card is really good. Especially in a world where Druid lost all of it's removal. Nightblade is a sad panda. A really good card to include in a lot of control decks. And it's neutral. 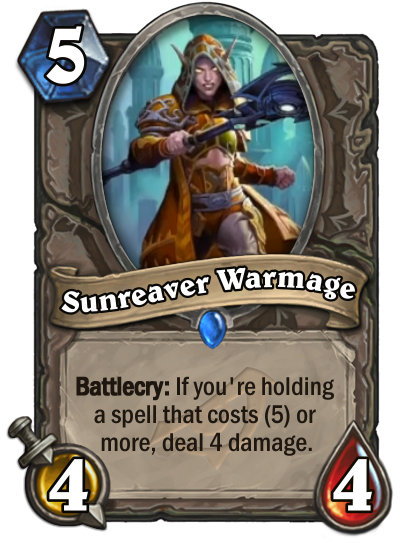 The only thing that worries me is the consistency - it will really depend on how many 5+ mana spells you have included in your deck. Sunreavers are Blood Elves. This one looks like a Night Elf. Something is not right here. Big Spell Mage in wild is going to love this. Compare this to Gormok the Impaler. Costs 1 more but much easier requirement to activate the battlecry, and it is not a legendary. If the condition can be fulfilled in your deck without making your deck worse, this is probably an auto include. Keeping in mind that it can hit face, it's just a really good effect that's useful in pretty much any situation. Seems really solid, will definitely see play. A slightly better version of Blackwing Corruptor. The condition is a bit harder to satisfy, but in some classes not even a big limitation. I'd be very surprised if this does not show up in a strong deck. Very good card. Very good card. Reminds me of Blackwing Corruptor which did see a healthy amount of play back in the day. Any sort of Control Mage will be able to activate this. I would imagine Control Warriors will be eye balling this as well. This card is an expansion too late. Big Spell Odd Mage would be begging for this card. So good. Might need it golden. 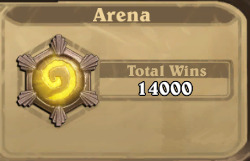 Needs the right deck, and big spell decks arent really in season. This will be in a lot of control or midrange decks. Very powerful. favorite card of the set.